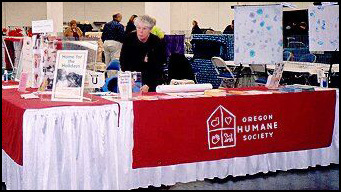 The Lewis & Clark Cat Club of Portland, Oregon has always helped support their local Oregon Humane Society. 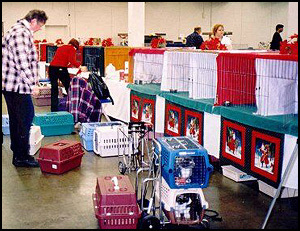 They offer them free space to set up an information booth at their December show, in addition to cages to display cats for adoption. 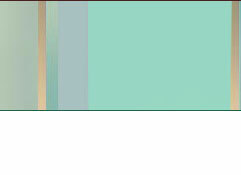 A portion of all the profits from the show is also donated to the Humane Society each year. In December 2003, the club decided to do something new. Copying an idea adopted by the Idaho Cat Club for several years, the cats from the Humane Society would not only be displayed at the show, they would be entered and compete in the Household Pet competition - the idea being that cats who were allowed to strut their stuff on the judging table and maybe even win a few rosettes would be more likely to be welcomed into a new home! In the spirit of the holiday season, both companies and individuals were invited to "sponsor" individual cats - paying their reduced entry fee and cheering for their favorite. Two club members, Alice and JJ Juan, volunteered to go to the Humane Society on the Thursday before the show to bathe all the cats that were entered. It's actually amazing the difference a bath can make! One of the very first cats that was bathed was a semi-longhair red tabby, who ended up with a wonderful full and fluffy ruff after his bath. Within 2 hours, he was already spoken for! Another club member, Joyce Lippincott, made simple cage curtains for all the cages. Inexpensive material in red, green and white solids made for a striking display in keeping with the Christmas theme of the show. A full row of cages was dedicated to the Humane Society kitties. The Christmas theme curtains were all hung in readiness for the cats' arrival. With 13 cats to bring from the Humane Society, a bit of organization was necessary :-). Volunteers, both club members and Humane Society volunteers, made quick work of settling each kitty into their cage. NOTE: No sharing of accommodations - each cat had its own double cage! With a total entry of 29 cats, the HHP rings were very popular with the spectators. With such a large entry, judging and finals took some time. The Humane Society cats did wonderfully at their first show. 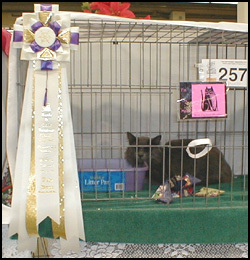 By the end of the weekend, every single Humane Society cat had gotten at least one rosette. The "Friskies Award" for the Friskiest HHP in show was awarded to a beautiful Silver Mctabby & White Spay named "Whipped Cream". 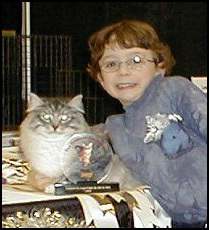 She is owned by Susan Lair and shown by her son, Nathaniel (Pictured on the right with Whipped Cream and her trophy and rosettes). Whipped Cream was adopted last year through the Oregon Humane Society at the Lewis & Clark show, so it was especially fitting that she win the grand prize at this year's show. Whipped Cream won the Friskies Trophy and prize coupons for lots of Friskies cat food. Nathaniel donated the food to the local animal shelter. He had a lot of fun dressing up as Santa's helper and delivering the food just before Christmas. Obviously, Nathaniel knows what real Christmas spirit is all about. Entering the Humane Society cats in the actual show and allowing them to compete in HHP certainly helped to draw attention to these wonderful cats. The public could see them in the regular show hall - rather than a separate area - and with the rosettes that they had proudly won. A very positive response from all involved resulted, and there were a number of successful adoptions over the weekend. Pictured on the left is "Shade" with his new mom and dad, along with "Mrs. Clause", Joyce Lippincott, one of the club's volunteers who helped with the showing of all the cats. This project also garners great local publicity and goodwill for the specific cat club and the cat fancy in general. Caring about all cats, not just pedigreed ones, is a very positive light that breaks down the public's perception that cat breeders are elitist. 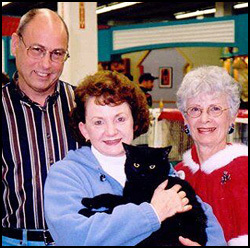 Including your local Humane Society cats in the HHP competition of your next show is a great way for cat fanciers to "give back" to the least privileged felines in your community. This is an idea that we hope will catch on with cat clubs throughout the fancy. Sponsors: Sponsors are easily brought on board with a bit of pre-show and flyer advertising and having a club member personally approach companies such as Petsmart, PetCo and cat supply vendors. Cage Curtains: Inexpensive material and a few hours at a sewing machine can produce dozens of sets of cage curtains. Or ask club members for old cage curtains they no longer use. Volunteers for bathing and grooming cats before the show: The Humane Society often has a roster of volunteers. One cat fancier experienced in bathing cats is all that is needed to lead a grooming "production line". Volunteers to handle the cats and help get them to and from the rings at the show: Individual sponsors may wish to be "in charge" of their cat. More often though, a sponsor is showing the cat more in "theory" than practice (especially corporate sponsors), so you will need volunteers to actually show the cats and take them to the rings. Having a few regular exhibitors ready to step in when needed makes the showing process run smoothly - and they can spell one another as they get busy with their own cats. Next Time: Although the Humane Society kitties behaved wonderfully, especially considering it was their first show, it was a lot to expect of them to go to all 8 rings. For future shows, the club may alternate the kitties, and just take half the cats to each ring - so each cat would only go to 2 rings in a day, rather than 4. Whether the kitties go to just a few rings or to all the rings, we know that showing in the Household Pet rings helps Humane Society kitties find new homes! It's a great idea for your cat club to consider for your next cat show! The spectator interest in the expanded Household Pet classes was huge!